As Edinburgh Capitals prepare for tomorrow’s Elite League fixture with Coventry Blaze at Murrayfield, player/coach Richard Hartmann is hoping the flexibility his players have shown in a run of seven wins from their last eight games will steer them to another victory. Hartmann, who has given his team plenty of rest after their two hard-fought 3-2 wins over bottom club Dundee Stars last weekend, said: “The guys were tired after those two games so we’ve been gradually building things up for tomorrow. “We’re really sticking together and playing as a team now which is what was missing from our game earlier in the season. All of Edinburgh’s recent wins have been by the tightest of margins, last month’s 5-3 success over Nottingham Panthers the only victory where more than one goal separated the sides. Last season Caps had a miserable record in close-fought affairs. 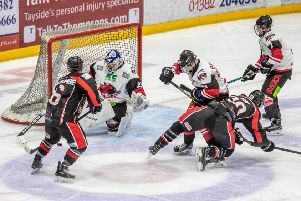 In games where only one goal decided the outcome or two if an empty-netter was scored by the winning team, Edinburgh lost 16 times, winning only seven. With more than half the season still to play, there is reason for optimism for those hungry Caps fans though. So why is this year’s team, which saw 11-new faces join over a busy summer, faring a lot better? Hartmann said: “What we have this year is more players who are happy playing in different positions. Having that flexibility makes it easier to make changes in the line-up or tinker with things during a game without leaving anyone playing somewhere they don’t feel comfortable. With Marcel Petran expected to return to the hosts’ line-up after missing two games with a back injury, and Blaze equal on 19 league points, another close encounter can be expected ahead of the Caps’ second home game of the weekend on Sunday when Fife Flyers visit Murrayfield. (both face-off at 6pm). Coventry, making their first of two visits to Edinburgh this season, were tipped as dark-horses for silverware, but after some disappointing results, departing Blaze coach and former Capitals forward Marc Lefebvre has been replaced by experienced American head coach Chuck Webber. Hartmann insists he is not fazed by pitting his wits against a man of 14-years coaching experience, including stints in the American Hockey League and the Russian dominated KHL. “I’m still a player,” said Hartmann. “That’s how I see the game so I don’t really care who’s behind the bench for the other team.